William served in the U.S. Army, serving in both the cavalry and infantry in the Philippine campaigns and in World War I. He rose to Master Sergeant of Infantry and was on the retired list when he became the Chief of Palos Verdes Estates Police Department. He held the rank of Deputy Sheriff and Deputy Constable of Los Angeles County. The Chief Police Headquarters was located in one of the rooms in this building in 1929. The building occupied several other businesses at the time. This was the Palos Verdes Estates Police Department In 1945. The population of PVE was 1,100. The officers also manned the fire trucks, fought fires and used their own cars for patrol. 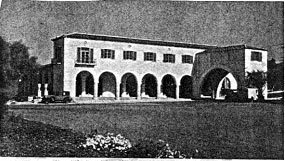 September 5, 1957 was the beginning of the new building, which we know today as the Palos Verdes Estates Police Department.